to greet visitors about an hour before Mass. Melanie Prejean Sullivan (left) is Director of Campus Ministry. I am Director of Catholic Worship. 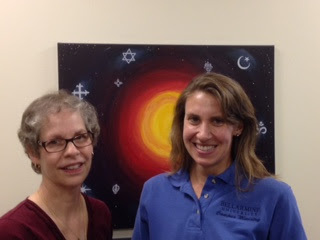 Karen Shadle (right) is Assistant Director of Catholic Worship and Campus Ministry. Evan and Nathan making sure all is ready and people are checked in. On this particular night I was preparing to deliver my 702nd homily at Bellarmine University. I still have almost all of them on my computer. Some are in books. They are available on my blog and the campus ministry website. "This is the Lamb of God!" BELOW: The four sections of the chapel. Some even return for a visit.....and they are usually in love!